1. Remote Start: Now standard on all models. All Phase Changer models have an internal link on the internal controller which allows for remote starting and stoping of the converter. This is a safe isolated 6V control loop, that simply needs an external switch or relay closure to operate. Remore start is typically used in refrigeration, airconditioning and pumping systems as examples. 2. Manual/Off/Automatic switch; connects to the remote start input and provides parellel control with external switching. Typically used to override the remote start switch when the converter needs to run constantly. 3. Neutral Balancing Transformer: In some cases it is almost impossible to configure a machine so all single phase loads are connected to L3. By fitting one of these transformers to the output of the converter, the neutral is centred between the phases so 240V will then exist between each phase and neutral. This is most typically used in inverter airconditioning systems where the 3 phases are being checked to neutral. 4. Soft Start: Soft Start reduces the inrush current when starting the pilot motor of the converter by as much as 50%. This will limit the incoming voltage drop at start up which in extreme conditions can lead to starting problems. This feature is important on larger models and is fitted as standard on these, but should be considered on mid range converters where there are known limits on the incoming single phase supply. 5. Coil Voltage Boost: Often Phase Changers end up in rural areas where poor power conditions exist. When a users 3 phase machine starts under load, there can be a momentary impact on the converters incoming supply voltage as additional start energy or power must be drawn from the incoming supply. Depending on the circumstances, these voltage drops can be significant, resulting in low voltages to the controller and input / output contactors inside the converter. The controller nominally works at 240V but has been engineered to work reliably right down to 160V for short periods. A special feature of the latest controllers is the ability to boost the coil voltage of start, run and load contactors from a nominal 240V to 400V (less voltage drops) during converter start events and anytime the converter goes into a level 8 ‘ ard start’. Alternatively, wide voltage ‘electronic coil contactors’ can be installed or retrofitted to existing converters where low mains voltage under load conditions is an issue. 6. 3 Phase outlets with safety switch can be factory fitted to any converter. 7. Plug in single phase supply for converters being moved to different locations. 8. Single phase welder function. This allows you to operate a 415V welder from L1 and L3 of the Phase Changer without the pilot motor starting. When swithed to 'welder mode’, the pilot motot will shut down, and an internal contactor will switch on applying 415V between L1 and L3 of the output circuit breaker. 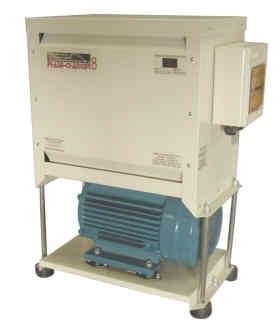 Phase Change Converters is continually improving and developing products, and specifications discussed on this website are current (June 2016) and subject to change without notice.